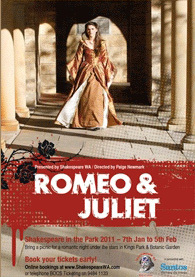 In the summer of 2011 Shakespeare WA produced its annual season of Perth’s favourite outdoor theatrical tradition, Shakespeare in the Park. The 2011 season marked the third production for Western Australia’s leading classical theatre company, Shakespeare WA (A Midsummer Night’s Dream, The Taming of the Shrew), who staged Shakespeare’s eternally popular romance, Romeo and Juliet under the direction of international Shakespearean Paige Newmark. The evening was as breathtaking as it was moving, with the production staged in its original Renaissance setting of Italy in 1600. Under the deft hand of Estonian designer, Ingrid Proos, the costumes lived up to their promise of being as stylistic as they were beautiful; the inventive set was bedesigned by Perth stalwart Jake Newby supposedly in his final retirement season, whilst the fight sequences were excitingly staged by one of Australia’s finest fight choreographers, Andy Fraser. The cast was headlined by WA’s brightest new young star, Rose Riley. She was supported by a mixture of Perth’s most trusted actors, Sam Longley, Glenn Hall, James Hagen, Stephen Lee, Claire Munday, Anna Brockway, Will O’Mahony, & Nick Candy, as well as exciting newcomers Cody Fern & Nick Pages Oliver and Kristian Barron. This production was made possible because of a partnership with Santos which has recently extended its long-term support of the arts in other parts of Australia, to now making a difference in the cultural life of the WA community. Sarah McNeil in The Post: Shakespeare WA’s young leads bring a youthful freshness to the story of two hormonal, lovesick teenagers. . . [while] the sword fights between the Capulets and Montagues are superbly staged and the elaborate and detailed Renaissance costumes are impressive. Julia Hern, in The Australian Stage: They were up to the ever challenging task of making Shakespearean dialogue accessible to modern audiences. The standout speeches in my opinion were Stephen Lee’s portrayal of Capulet in “God’s bread it makes me mad…” His threatening dominance of his daughter, wife and the nurse came across with power and passion. The West: Will O’Mahoney’s fiery Mercutio delivered the sort of surprise and humanity that are the great strengths of Shakespeare’s characterisation. Rose Riley as Juliet brought impressive beauty and strength to the work.